What a brilliant idea this Texas Homeowner had to help beat the heat. Chris Goggans, Flower Mound Texas Home Inspector found this treat while inspecting this week. We bet the neighborhood kids hit this up pretty often come summer time. 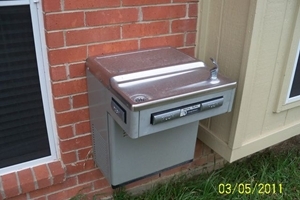 Exterior water fountains are not part of a Home Inspection yet this is a unique find. To see what all is included in a Home Inspection CLICK HERE to get a copy of a sample report.